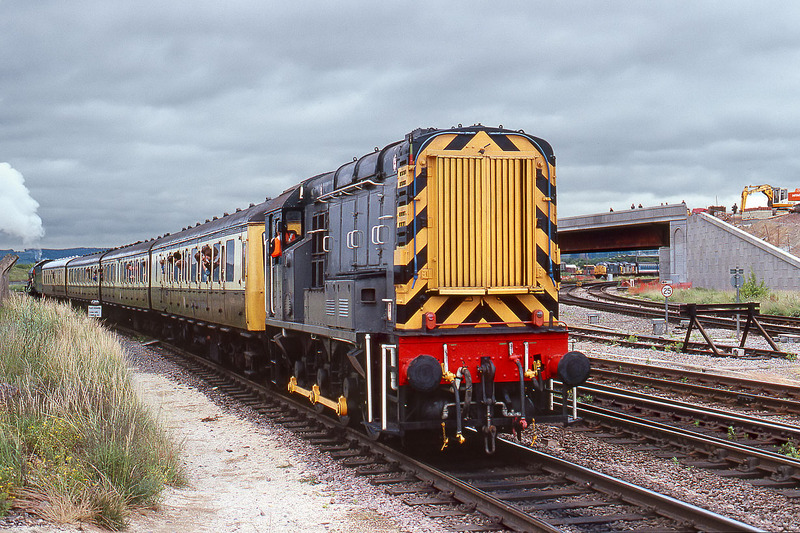 08795 was employed on a series of Gloucester station to Barnwood Junction shuttle services during the Gloucester Rail Day on 1 July 1990. It is pictured here at Horton Road Junction bringing up the rear of the train as GWR 4-6-0 6024 King Edward 1 takes the train round the curve towards Barnwood. The stock is Class 117 DMU set B430 (51410, 59520 & 51368) with an additional coach in matching Great Western livery. The sun almost came out for a few minutes on an otherwise very overcast day, which has certainly accentuated the dark clouds in the background. Other points of interest in this picture are 37100 & 37074 visible under the bridge in the background on one of the numerous mini railtours run in connection with the event, and the unfinished state of the bridge and embankment on what is now the A4032 Metz Way.